By Lt Col Juan Tinnirello, photography by Lt Col Tinnirello except as noted. The meeting took place on 6 June and started with the Pledge of Allegiance to the Flag, led by Lt Col Tinnirello. 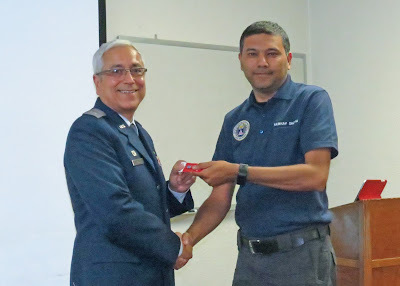 Capt Rivas welcomed all participants and proceeded to review the Cadet Protection Program, as mandated by CAWG’s Cadet Awareness Day. A quiz followed the presentation. Members socializing prior to the meeting. On18 May, 1st Lt Kraus (MP) and Capt Stevulak (MO) prosecuted an EPIRB at Salinas. On 30 May, 1st Lt Choate (MP), 1st Lt Rugroden (MO), and Capt Hayes (MRO) prosecuted an ELT in San Jose, resulting in a FIND. Congratulations! SM Sharma (L) and Capt Hayes (R). Travis AFB Open House / Air Show. 1st Lt Roudnev attended the air show on Saturday, 6 May, and Lt Col Tinnirello on Sunday, 7 May. A multitude of people attended the event, which had many military as well as civilian and law enforcement aircraft on display. The aerobatic presentation by civilian pilots as well as the USAF Thunderbirds was excellent. The local CAP squadron helped with crowd control, and brought an aircraft for display as well as a recruiting booth. It was a beautiful fun event. Photos of the event can be seen at our Facebook page. Lt Chavez (L), Lt Col Matarrese (C), and Capt Perreira (R). Group 2 Basic SAREX at Palo Alto. The event was held on the weekend of 13-14 May. Participants from Squadron 188 included Capt Brown, Capt Hayes, 1st Lt Choate, 1st Lt Roberts, SM Campbell, and SM Devine (who since then has been promoted to 1st Lt – congratulations!). HF Exercise. 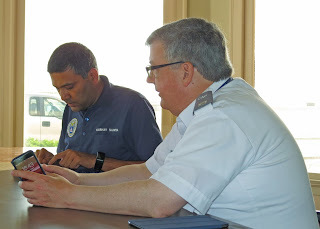 Capt Hayes participated in the quarterly USAF HF Communications Exercise on 17 May. USAF Glider Clinic at Minden/Tahoe Airport. Capt Gast and 1st Lt Choate participated in this USAF event from 17-10 May. This sounded like a fantastic event. – click here for a blog post with more information about this event. 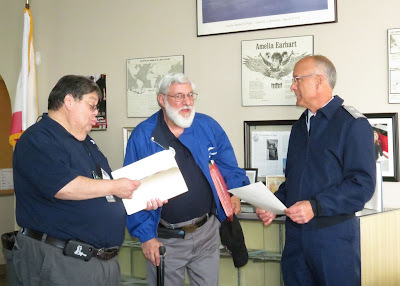 Please contact Capt Gast if you have interest in learning more about gliders. Plane Washing. On 28 May both aircraft at Oakland and Livermore were washed in preparation for the Squadron photo shoot/BBQ on 30 May. Thanks to all for a job well done: Maj Luneau, Capt Eichelberger, Capt Hayes, Capt Perreira, Capt Stevulak, 1st Lt Choate, 1st Lt Spears, 2d Lt Booth, SM Devine and SM Sharma. Photo Shoot & BBQ. On 30 May: Members of the squadron and guests gathered for a squadron photo shoot and BBQ. Click here for details! Thanks to all members for their food/help contribution. A photo re-shoot scheduled for 11 July (All Hands Meeting). G1000 Training. On 1 Jun, the squadron hosted a Group 2 G1000 Ground school at OAK - thanks to Maj Michelogiannakis, Maj Blank, and Maj Luneau. 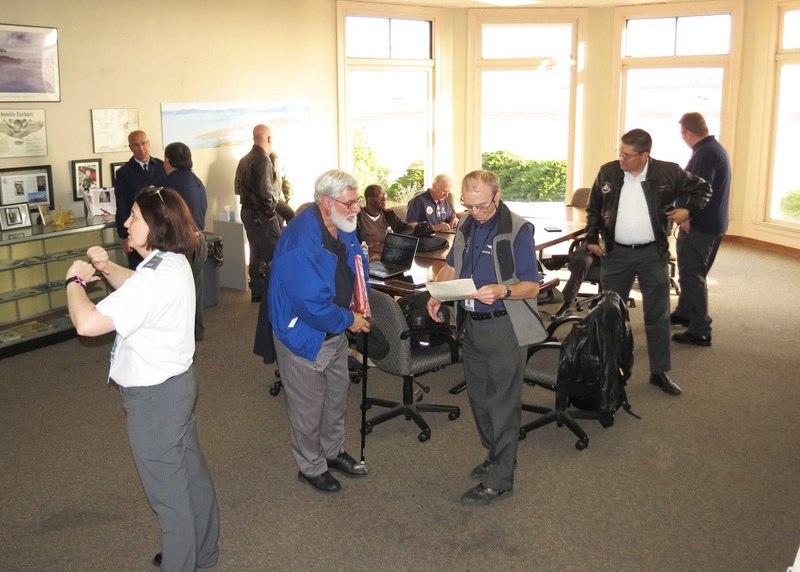 Group 6 Basic SAREX at (KMER) Castle Airport on 3-4 June. Squadron members attending included SM Campbell and SM Sharma. Congratulations to the following members for their efforts to achieve and/or renew their ratings. 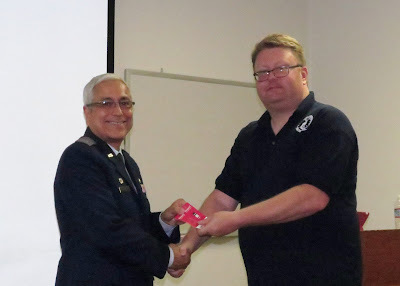 Lt Spears (R) receiving his Red Service Ribbon from Capt Rivas (L). SM Sharma (R) receiving his Yeager Award from Capt Rivas (L). 1st Lt Spears: 5 years Red Service Ribbon with Bronze Clasp (includes cadet time). 1st Lt Adams is looking for a replacement Transportation Officer. He has performed 5 excellent years of duty. Thank you for your outstanding service, Lt Adams. 4 July: NO MEETING. Moved to following week (11 July) due to the holiday - Happy 4th! SUI before the end of August (department heads). August: Goup 5 SAREX at KSTS (Charles M. Schulz–Sonoma County Airport). Hydration - this month's safety topic! How does my body lose water? The body is well over half (by weight) water that is held in cells. We lose water through waste, perspiration and even breathing. When the body loses too much water, we begin to get dehydrated. How do I know if I am dehydrated? 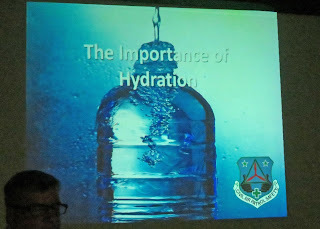 Some of the symptoms of dehydration are: dry mouth, sleepiness, extreme thirst, headache, confusion, feeling dizzy. How do I get hydrated? The best way to prevent dehydration is to know what your activities will be and plan accordingly. If you plan to be outside for an extended period of time or work out you should typically have two glasses of water 1 hour before the start. Every 15 minutes you should have 4 oz of water and then have two glasses of water for every pound you lost. The best liquids to consume are water or sports drinks, which help replace minerals and electrolytes. For rehydrating, fruit juices, caffeinated beverages, and alcohol drinks are not the best items.